De-stressing from everyday life, this beauty has found her Island Getaway. Tucked between the stress of living and the open road, is her slice of heaven. Trying to ease the strain of the daily grind, she finds herself a private getaway and escapes to the crystal blue ocean where she casts off her troubles. Reclining in a woven hammock she is lulled to sleep by the lapping of rhythmic waves against the shore. Hibiscus flowers engulf her senses as she drifts off in total abandonment. 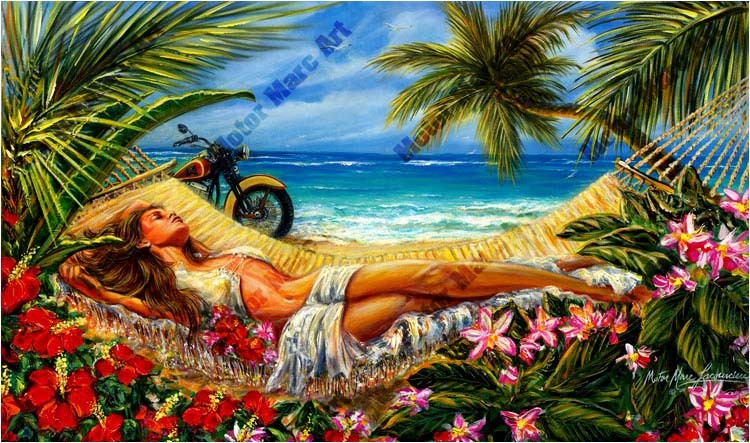 “Motor” Marc’s painting captures the style, texture and feeling of Caribbean art and is sure to please any island dweller. Using a bright acrylic palette with glossy raised and embossed textures, the painting comes alive amongst the tropical flora, which gives you the sense of dimension in native art. This naturally draws you into the beauty of the tropics, filling your senses as you feel the sand between your toes.